My hip broke badly, after a fall, and needed a brace plate. It was awful surgery! So painful and hugely debilitating! I was still laid up at Christmas, despite breaking it in August! Add that it led to PTSD too, and you can imagine that Christmas was tough this year. But I wouldn’t let it stop me! We went Christmas shopping earlier than usual, it helped to keep busy. So as the Christmas markets opened, I’d virtually finished! I still enjoyed wandering the markets though, it helped to lift my spirits. Our cruise had to be cancelled sadly, I just wasn’t well enough. So we booked a short break in York. It was much needed! Getting away for just a few days and forgetting about everything, was perfect! I loved every minute! With this in mind, I’ve planned a few breaks, for just me and my hubby, next year. We really need some time to just relax and enjoy ourselves. It’s definitely an essential! Saving energy, I gift bagged all the gifts instead of wrapping them all. 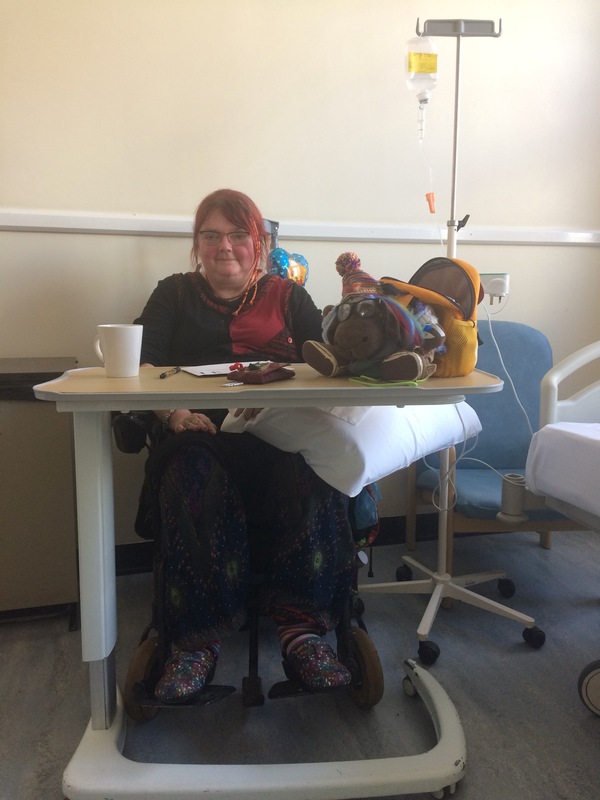 Card writing was done during my many hospital visits too, the perfect way to pass the time. We were ready! Yule was a family event, we shared food and exchanged gifts. Lots of fun games and some mulled wine, plus burning the Yule log. Perfect! I was in the mood. Christmas Day was going to be different this year – a group of friends from the assistance dog group felt lonely and were thinking of cancelling Christmas this year. So I came up with a plan, why not celebrate together??? They grabbed at the idea! So we’ll be spending the day with friends! No centerparcs this year for the first time, but new year my hubby is off work, yeah! So we can relax together enjoying seasonal tv and the fireworks at midnight too. We’ll celebrate, whatever is going on around us! Today my son is going to a concert in Birmingham, so needs a lift there. I decided to go along too so we can visit the Christmas markets and enjoy a film too! Saying YES to fun! I’m planning on saying YES as often as possible starting today! So, despite a huge lack of spoons following our mini break, I’ve spent the day searching for fun! Now I have a calendar filled with fun things, mainly museums, stately homes and interesting villages to amble around. I’m booked up right up to May half term! I’ve also sent an email to a accessible mountain climb too!!! After an absolutely amazing short break in York, I’m back feeling festive. It was just perfect! We wandered the market as soon as we arrived, after checking in at our hotel and dumping the bags. The light was fading, so the fairy lights created a perfect atmosphere, I was in heaven! Our plan was to then return to the hotel and enjoy dinner, but the hotel food wasn’t great. No problem though, we could just wander out to eat! The next day we woke feeling excited. Lots of museums later, and we were filled with fun. A hearty lunch, followed by a drink in the heated tent – hot cider, yum – and we were ready to rest. A very fulfilling day. Our return home was broken up by visits to a couple of places. Leeds, to see the German Christmas market, followed by Harrogate. Then home. Mini breaks are definitely worth the spoons, so I’ve booked more for the new year. Telford in January for all the Ironbridge museums and maybe the Black Country museum too, and Wells in March for Glastonbury fun and the various standing stones too 👍🏻👍🏻👍🏻. I can’t wait! Now when the fun of the season is over and it’s grey and cold, I can look forward to our breaks! I’m glad that I ended my book last year as this year hasn’t run smoothly at all! My broken hip and subsequent heart problems, plus PTSD has resulted in a pretty rocky Christmas. I’ve spent hours round the garden centres etc in September and October to take my mind off the trauma, so I did buy my gifts. But now my get up and go has gone, so I’m struggling to wrap presents and parcel them up to send, or write cards. It’s the 3rd of December and I’ve only just received my advent calendar! It was in the attic and my hubby was too tired to get it after working nights. I also have only just got my tree decorated. Not by me, I can’t stand up for long enough, but by my hubby and youngest son. So it’s wonky and nothing like it usually looks, but it’s here! Christmas Day is going to be totally different this year too. A few friends were planning to cancel Christmas, so I suggested a get together. We’re now spending the day at a scout hut. But we’ll be amongst others, so that’s the main point isn’t it? Better than it just being us here alone. I’m currently writing my third book. I’m just writing a few words per day, so it’s not too taxing at all. There is no rush, as it won’t be ready until this time next year. So I can enjoy the process without wearing myself out. 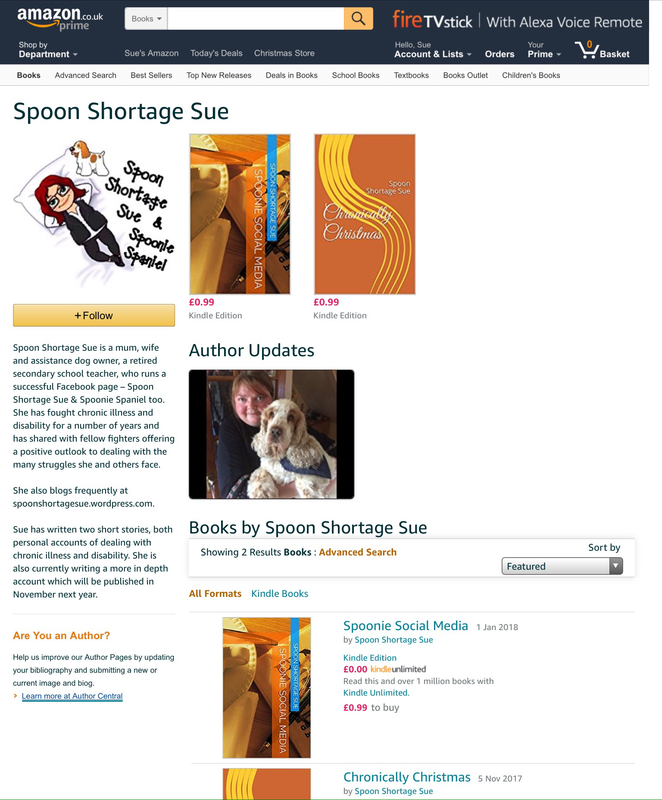 The perfect Spoonie book! I’m thoroughly enjoying writing, and it’s a pleasure to read the reviews on my current book too, it’s a boost as I’m writing, to see the response I’m getting. 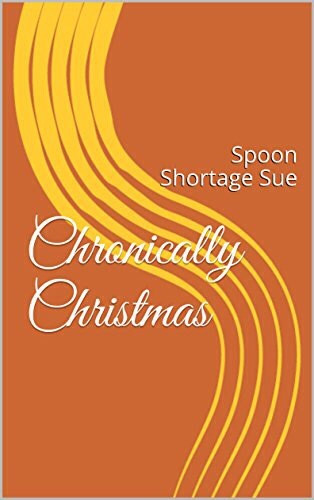 After selling 140 copies of Chronically Christmas the rankings are soaring!!! It’s infusion time again, or as I like to call it, boost juice. These fortnightly visits come around quickly. I’m passing the time catching up on paperwork and writing the next section of book 3. I’ll feel really grotty for a day or two, but after that I’ll get some energy. Perfect! I published my first short story today, on Amazon Kindle!!! And already I’ve sold a number of copies and had a really positive review!!! My next book, a longer, more in depth, short story will be published on 1st January 2018! Pre-order is available.